I have to admit Goldens must be the most photogenic dogs. That top pic deserves a frame in your house, it is so cute. Stinks for me that my dog's eyes glow in nearly every photo! My dog does the same thing with the hugs! He must be in the middle of it all. I wish we had snow! Sad. Stupid Texas. Doesn't get any cuter than pups & babies! And I love the pic of you "story-telling" - the sign of an excellent time. You guys are so cute! Been busy with holiday parties, too. This past weekend was chocked full of activities. Then, yesterday was a snow day for the kids so that made for an interesting time. Hopefully the ice/sleet mix that's coming in will miss us. Fingers crossed! I love Buddy! You two blondies are perfect together. And oh my goodness, the babies! That's intense. Your pup is too sweet! 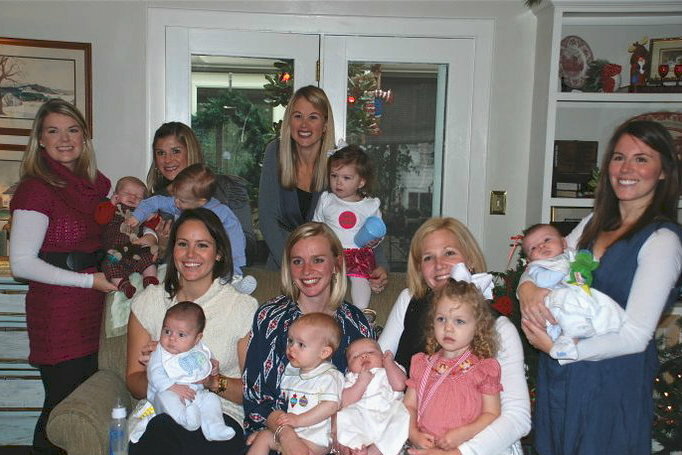 And all those babies - oh my! Love your necklace and polka dot tights! Beautiful pictures! and wow - that's a lot of baybays!! Your "sweet blonde boy" is absolutely adorable - he looks so happy and content!